Brief career history: I started performing professionally at age 15 before graduating with a Theater degree from Principia College. After graduating, I was taken on as an apprentice with puppeteer Tony Urbano in Los Angeles for 8 years. Following this, I re-established my own company THE HUBER MARIONETTES with David Alexander in 1980 before starting to perform on cruise ships in 1983. Phillip is best known for his work in the 3-time Academy Award nominated film BEING JOHN MALKOVICH, and his latest project helping to bring the character of "China Girl" to life in Disney’s film OZ THE GREAT AND POWERFUL. In the contemporary art world Phillip created a special rock opera, DON’T TRUST ANYONE OVER THIRTY in collaboration with concept artist Dan Graham & video artist Tony Ousler for performances in Miami, Berlin, Vienna & Minneapolis Contemporary Art Museum venues, plus an art installation for the Whitney Biennale 2006 in New York. Phillip’s own production of SUSPENDED ANIMATION has been seen worldwide with theatrical appearances in Japan, Spain, France, Switzerland, Israel, Chile, South Korea, Norway, Brazil, Ireland, Canada, Mexico and Portugal. Phillip’s television appearances feature THE TONIGHT SHOW with Jay Leno, LE PLUS GRANDE CABARET DU MONDE on French TV, NOCHES DE GIGANTES for Chilean TV, SHOWBIZ TODAY for CNN and numerous commercials. His nightclub performances include the LIDO in Paris, CASINO DE MONTE CARLO in Monaco (also a ROYAL COMMAND PERFORMANCE for Prince Rainier), THE MAGIC CASTLE in Hollywood, RAINBOW & STARS in New York, as well as on luxury cruise ships around the world. When/how did you get into entertainment? My mother gave me a puppet when I was 3 years old, to help me express myself. I expressed myself into a career. Funniest thing that has happened to you on board? Performing while the ship was going through typhoon-whipped seas. A staff member had to hold the back of my stage platform down to keep it from tipping over. Most embarrassing thing that has happened on board? Airlines lost my luggage. I attended formal dinner in tuxedo from my carry-on but only black socks, no shoes. Favourite port of call and why? Venice. I like to leave the ship and walk through the city until I am hopelessly lost and slowly find my way back. Around every turn is another interesting vista with remarkable architecture. What would you do if you were not in the entertainment business? Painter/Sculptor, doll maker. How long are your contracts on the ships? Average is one week. What item would you not travel without? My cell phone. If you have ever arrived in a foreign airport with 300 lbs of luggage and no transport has shown up, you know what a "life saver" the cell phone can be. Take a look at Phillip’s career in the short video below. 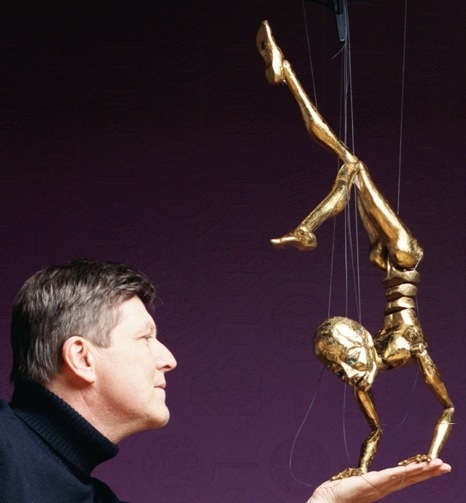 For more information about Phillip’s work, please visit www.hubermarionettes.com.